Apivar can be used anytime supers are off the hive. It is effective and has been used in Europe for many years. The strips are a long lasting release strip. These are two uncommon winter birds in the northern metro. 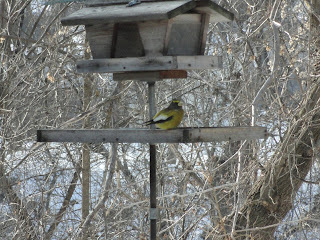 Male Evening Grosbeak, common in northern Minnesota. We see them down in the metro area occasionally. I had installed a thermometer with a removable probe in my hives. I checked the temps yesterday when it was zero degrees outside -- it was 87.6 degrees where the probe was inside the hive. The cluster must have been nearby. It just amazes me how warm their clusters are! Diana, I picked up indoor-outdoor thermometers with removable probes at Menards (less than $10 each). I drilled a small hole in the center of the moisture board, inserted the probe, and plugged the hole shut with the probe inside. I ran the plug end of the probe out through the slightly propped telescoping cover just far enough so I can plug in the brains of the unit when I want to take a reading. I covered the plug end with plastic when not in use so I don't have to de-ice it before using. Seems to work well for now. Once we get the next thaw, I plan to check honey stores and check/adjust the probe location in the hive. Let me know if you have other questions about it. I was using the thermometers to help me determine whether I still had two colonies wintering over. When I took the initial reading it was 0 degrees outside: the Carniolans were at 87.6 (yeah! ), but the MN Hygienics were only 12 degrees. While I'd like to believe that the one probe wasn't anywhere near the cluster, I've been suspicious that my Hygienics weren't doing well this winter. I haven't seen them near entrances, haven't seen dead bees or debris in too long, and their moisture board has looked dry for a while. In contrast, I often see the Carnis' guard bees near the upper entrance, an occasional dead bee on the hive stand, and evidence of moisture exiting the hive. Hopefully we'll get a warm day here soon so I can inspect the hives. From a facebook friend:" I had installed a thermometer with a removable probe in my hives. I checked the temps yesterday when it was zero degrees outside -- it was 87.6 degrees where the probe was inside the hive. The cluster must have been nearby. It just amazes me how warm their clusters are!" 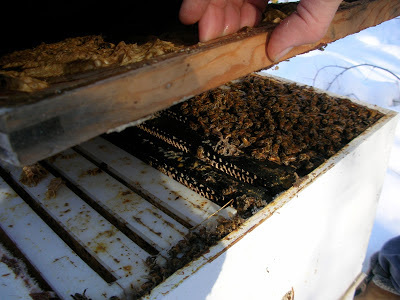 Bees start winter in the bottom box (two box hive) or the middle box (three box hive). In most hives this time of year the cluster of bees have moved up in the hive. The cluster of bees should now be in the top box. That is why bees store honey above them. They move up in the winter. The warmest part of the hive is the top box because heat rises making it easier to keep the brood warm. The queen will start laying in around two to three weeks and the cluster of bees will be eating more honey to produce heat to keep the brood warm. So by mid Feb a hive food check is a must. I am in the process of mailing out Package Bee Order Forms. They should all be in the mail by Friday the 18th and everyone I have an address for should have one by next Wed the 23rd. "Olivarez Honey Bees has been working with the “Bee Informed” Tech Transfer Team that was envisioned by Dr. Marla Spivak and formed nearly five years ago in the Heart of Northern California as a tool to help queen producers select and maintain the best bee stock available today. From the information collected by the Tech Transfer, OHB has been able to continually improve in areas of Hygienic Behavior, brood rearing production and honey production. OHB has also been able to monitor its Nosema, mite and virus levels accurately and knowledgably. Nosema levels at OHB have been consistently low over the last couple of years which could be attributed to the essential oils they use or just as simple as downward trend naturally. By monitoring Nosema levels monthly through the Tech Transfer Teams service OHB has probably saved over $30,000 the last couple of years with unnecessary treatments. OHB still treats their cell builders and nucs they raise their queens in." 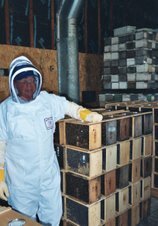 Olivarez Honey Bees have been our bee and queen supplier for nine years. They have done a great job delivering a quality product. Took a peek at a hive I wintered. Good thing I did. I knew this hive was light on stores. They have eaten most of the food in the top box on that side of the deep. There is some full frames of honey on the other side of the top deep. This is a good example of a hive consuming honey and now don't have any full frames next to them. Tomorrow I will go out and reposition some full frames of honey right next to the cluster. This should help them survive a cold blast that looks like it is a week away according to the weatherman. If I don't do this this colony will starve in the very near future because they will not be able to reach the full frames of honey in their present position. A quick peek and look at the tops of the comb. In this picture it is obvious that the top of the frames look empty. This should be a clue that the whole frame is more than likely empty of food. Putting on a beesuit and lighting a smoker the quick peek and move a couple frames of honey right next to the cluster takes about one minute. The two frames next to the cluster look empty. Ed Simon from Oronoco, MN has made a series of woodworking videos. The videos explain how to build a bee hive. 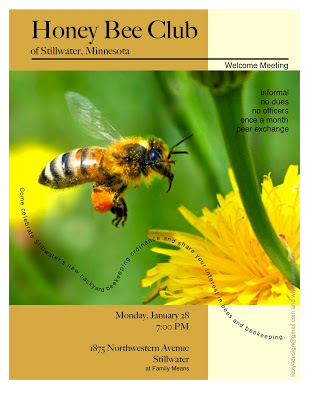 Ed has talked at the MN Hobby Bekeeper meeting on this very subject. All his videos are on youtube here is a link to his channel. I have published my 2013 package bee prices on my website. The Italians and MN - Hyg breeds have merged and will be called Hygienic Italian. The MN - Hygienic queen has always been an Italian. I will be offering Hygienic Italian and Hygienic Carniolans. All the bees have hygienic behavior and have the VSH (Varroa Sensitive Hygiene) bred into them. I will be sending out information in the next two weeks. Working on an online form and an online payment system. So far this winter has been perfect for a Minnesota winter. There have been a few days that have been cold but nothing out of the ordinary. The plus that I have noticed that so far we have not experienced any sub zero windy days. It is this type of weather that kills colonies. The wind cools the hive down and is unrelenting until it finally moves out ot the area. Straight cold weather is not difficult for the bees to survive. 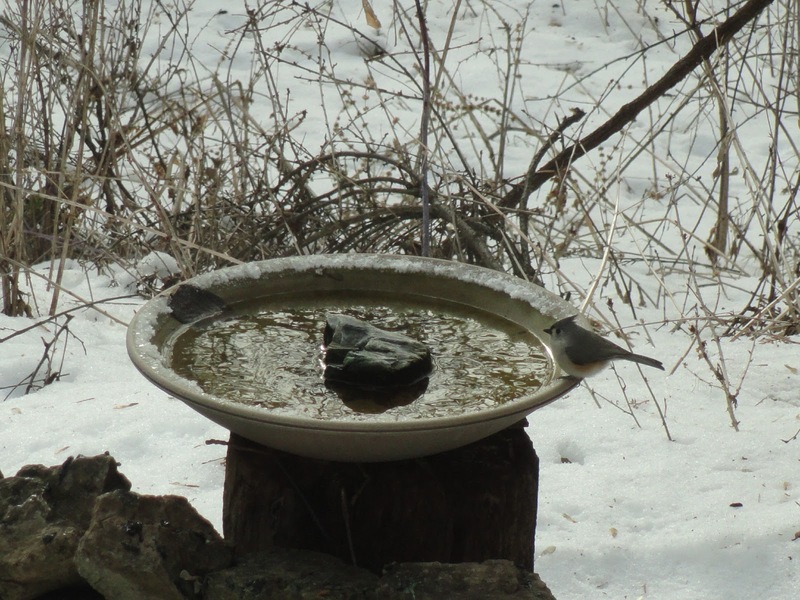 This week the weather is moving into the thirties for a January thaw. The bees will be flying and taking cleansing flight taking advantage of the warmth. The warmer temperatures will help bees reposition in the hive. Hopefully the bees will get on some full frames of honey to prepare for colder weather that always seems to hit around the third week of January. This is a youtube link slide show from Jerry Linser that is appropriate this time of year. There is a new bee club starting up in Stillwater. As you know the city of Stillwater changed their ordinance to allow keeping bees in the city. 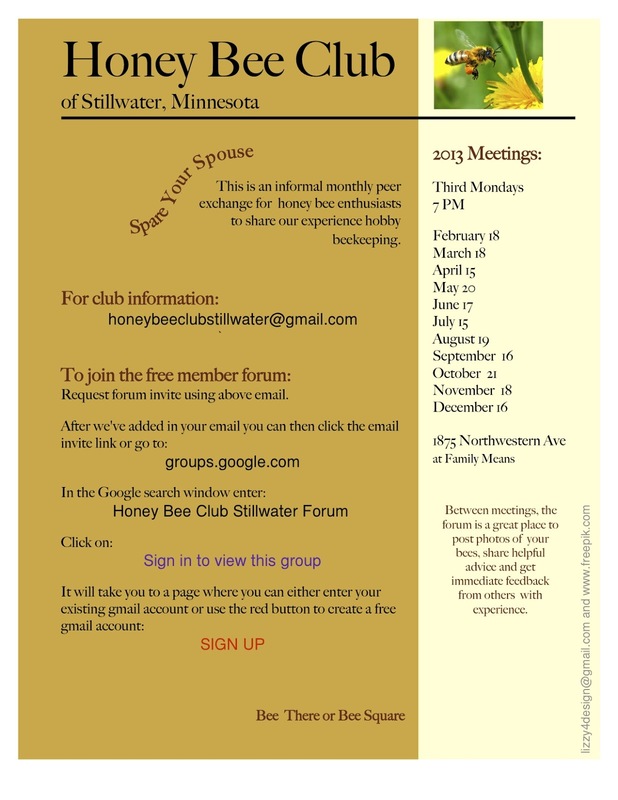 Now the new beekeepers are starting a new club for peer group information. The bee clubs first meeting is Monday Jan 28th @ 7 pm. Address 1875 Northwestern Ave. Stillwater, MN at Family Means. I have made several posts about honey melters or bucket heaters that will liquify granulated honey. This new video is about a stainless steel honey bottler. Bottlers work great for liquifying honey. It makes bottling honey fast and clean with no dripping from a honey gate. Stainless Steel bottlers are spendy starting at around $1200.00, but they do hold thier value very well. Used bottlers are hard to find. It is one item that beekeepers really hold on to. I did buy a used bottler nineteen years ago for $500.00. That same bottler that I still use today I could get $900.00 for it if I wanted to sell it. The only thing that wears out on them is the immersion heater or o - rings on the no drip bottling valve. I did purchase one immersion heater for my bottler since I have owned it. I have changed the o - rings once. Double Click on the video for full screen. Press esc to downsize.